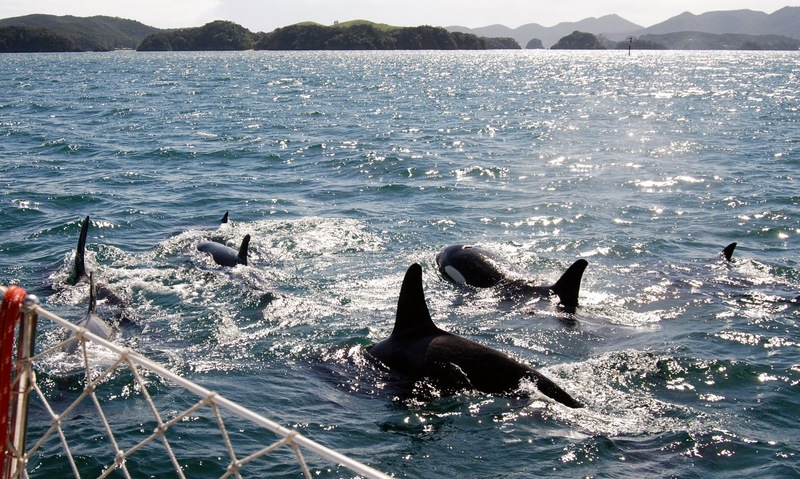 We recently spent a day following orcas here in the Bay of Islands. When we were with them they were enjoying sting rays as appetizers. When we left, they were heading for a different bay, presumably for a main course of dolphins. Later in the day, they joined us in our anchorage in Urupukapuka Bay for an after-dinner treat: more sting rays, a favorite for the New Zealand orca. 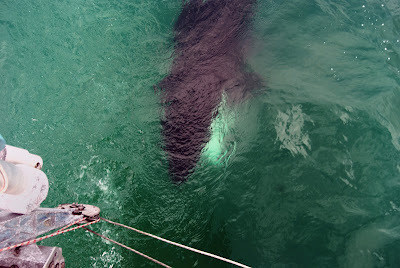 An orca slides beneath Momo's transom. We were first notified of their presence as we were drinking our morning coffee by Jochen Zaeschmar, who came to New Zealand some twelve years back because of the marine life here, which marks both his passion and profession. 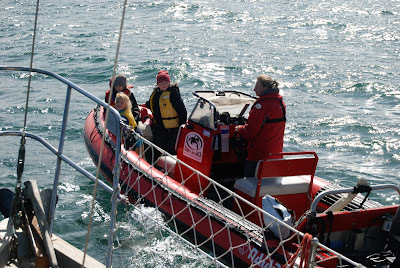 We upped anchor and Momo followed the orca around all morning, along with Jochen in his boat and Ingrid Vissar, a New Zealand native who has devoted her life to understanding the NZ orca. Ingrid the Orca Researcher collected the kids so that they could have a better view. Jochen and Ingrid interact with these animals the way most people would with their dogs. They call to them, talk to them, laugh and splash with them. They have even gone into the water with them. 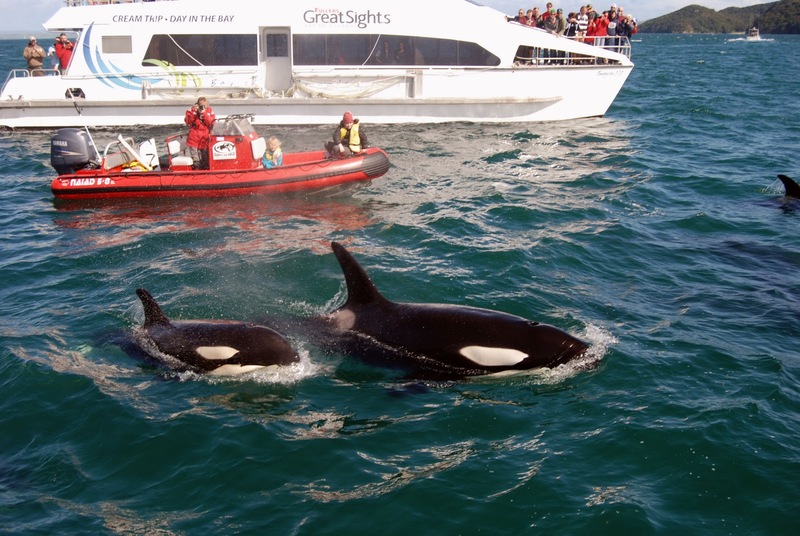 Ingrid has categorized and named a great many of the local NZ orca. There's Nibbles, Funky Monkey, Miracle, Yin, and even Moby -- named after Jochen's dog who has his own relationship with the orca as well. There are only 200 - 250 in all of NZ waters, and Ingrid knows many of them personally. Orcas swim between Momo and Ingrid's boat. Talk about crossing boundaries and borders -- Ingrid drives the length and breadth of this country to track the orca and know them more. Meanwhile the orca seem to swim up and down both coasts, from North Island to South Island and back again, in patterns that researchers are only beginning to understand. 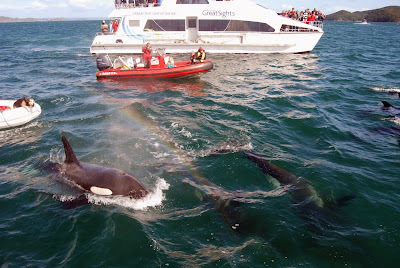 You're as likely to find them in Auckland harbor as in Bay of Islands, or even further south. They alternately head off on their own (particularly the males) and then return to the group/family, sometimes regrouping hundreds of miles away. Small groups hunt together, teach the young, and court and play. 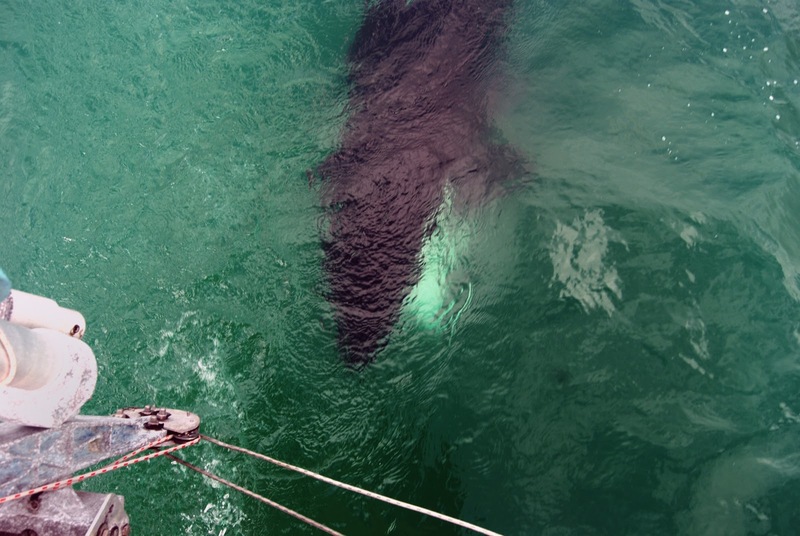 Our encounter with orca makes us think about our own travels in a world without highways. There are no roads out here -- just a whole lot of blue. We equip ourselves with charts and GPS and radar and depth sounders; the orca have all that built in and follow their own waterways. Jochen's close enough to reach out and touch them. ...and now they're coming our way. We never know where they're going, but they sure do. Is that COOL or what?! Thanks for posting! Oh my Lord. Is there anything about your life that isn't fantastic? really like the way this piece ends with the way the orca "travel". What Chris said. :) Wow. What an experience! Nice pics, too.